The Morpho is a butterfly from South America that has some incredible design features. 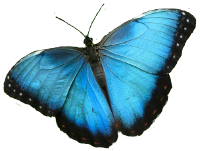 All butterflies have features that are impossible for evolutionists to explain, but the special blue color of the Morpho is extra special. 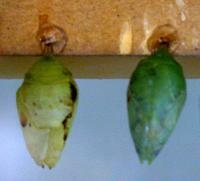 A butterfly starts its life as a caterpillar. When fully grown the caterpillar then for some reason attaches itself to a branch hanging upside down, covers itself with a chrysalis (protective covering), dissolves its body and all of its internal organs, rearranges the millions of cells into new structures, and then emerges from the chrysalis as a butterfly. The ability to fly is no small task. An airplane uses the simple principal of lift to fly but a butterfly uses much more complex methods including wake capture, vortices at the wing edge, rotational mechanisms and 'clap-and-fling' mechanisms. No one has ever observed a non-flying creature develop the ability to fly, but if evolution is true then flight would have happened accidentally four times (in insects, birds, bats, and pterosaurs). 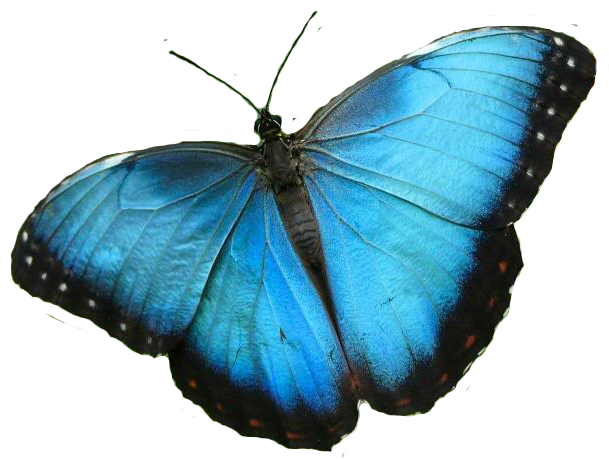 What makes the blue color of the Morpho special? There is no blue color. The picture you are looking at has blue in it but the butterfly does not. Researchers have found that this butterfly has no blue pigment on its wings. If you use a electron microscope and look at the wings of a Morpho you will notice thousands of rows of cones on every scale. 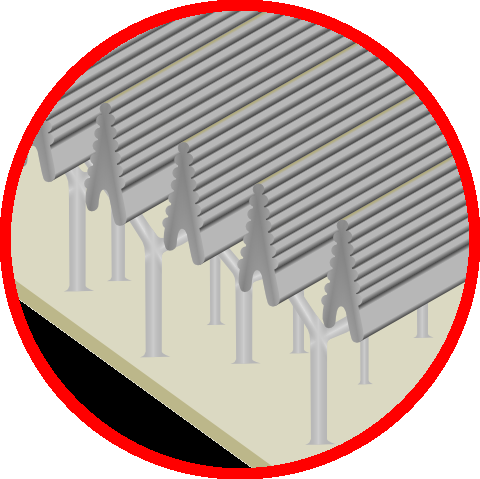 These cones have ridges on them that are spaced 0.00022 mm apart. That is 1,000 times smaller than the width of a human hair. 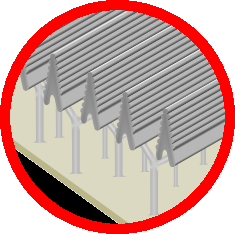 These rows are so straight that the maximum distance they go out of line are 0.00002 mm. No machine humans have ever made have this type of accuracy! If two people hold a rope and shake the end up and down you will notice some of the waves cancel each other out. The ridges on this butterfly do the same thing with light. The ridges are spaced exactly far enough apart to reflect the blue light but cancel out the other colors. Evolution has no way to create beautiful structures just for looks. These wings were created to show the handy work of God. 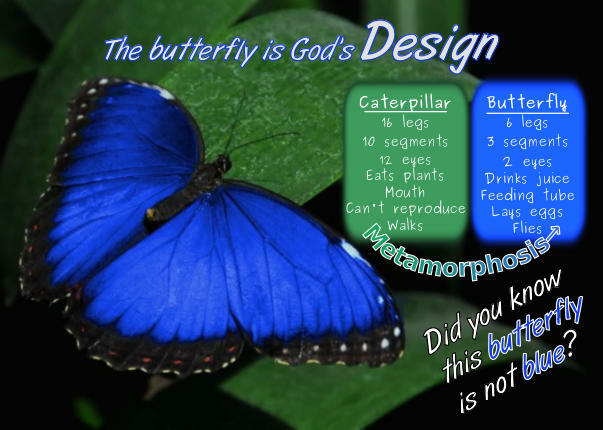 The metamorphosis and the complex surface of these wings would not be possible unless God designed the DNA. The DNA of a butterfly contains more information than any computer program ever written. Information always comes from an intelligent source, and cannot be produced by time and chance. Evolution could never produce this incredible detail just for looks. 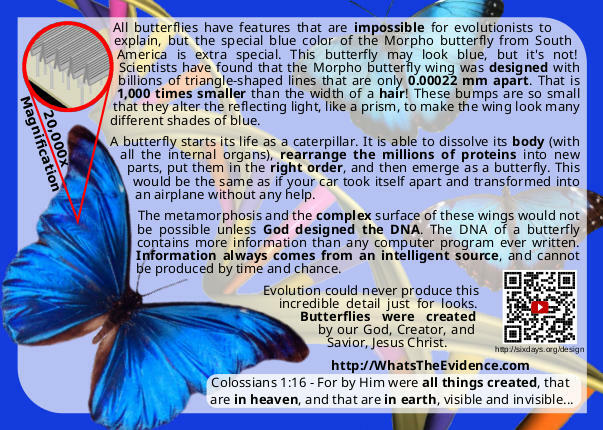 Butterflies were created by our God, Creator, and Savior, Jesus Christ. For I am not ashamed of the gospel of Christ: for it is the power of God unto salvation to every one that believeth; to the Jew first, and also to the Greek. For therein is the righteousness of God revealed from faith to faith: as it is written, The just shall live by faith. For the wrath of God is revealed from heaven against all ungodliness and unrighteousness of men, who hold the truth in unrighteousness; Because that which may be known of God is manifest in them; for God hath shewed it unto them. For the invisible things of him from the creation of the world are clearly seen, being understood by the things that are made, even his eternal power and Godhead; so that they are without excuse: Because that, when they knew God, they glorified him not as God, neither were thankful; but became vain in their imaginations, and their foolish heart was darkened. Professing themselves to be wise, they became fools, And changed the glory of the uncorruptible God into an image made like to corruptible man, and to birds, and fourfooted beasts, and creeping things. Wherefore God also gave them up to uncleanness through the lusts of their own hearts, to dishonour their own bodies between themselves: Who changed the truth of God into a lie, and worshipped and served the creature more than the Creator, who is blessed for ever. Amen.